I've been a fan of The Dresden Files for a while. Mike Weaver (my co-writer on Open Mike Night) introduced me to the books years ago. I even liked the short-lived TV series on Sci-Fi. All that said, this is my first time reading any of the comic series. According to Dynamite, this series takes place a few months after the events in the book White Night. Summary (contains spoilers): The issue starts with a dark wizard working on a spell. The wizard seems obsessed with the fact that it is so cold tonight that the homeless men in the streets won't survive. His spell requires a sacrifice. and he places a picture of a man in front of some kind of demonic altar. The scene switches to show this same man, Sam Fogle, working at a pawn shop. He lowballs a customer on a pocket watch, and she leaves in tears. Some kind of creature appears and kills him. The next day, Harry Dresden and his apprentice Molly are working on developing her skills. He is having her practice levitating Scrabble tiles. Molly is getting frustrated by this, but she's keeping her emotions in check for the most part. The phone rings and they are called in on the pawn shop murder. The man's body seems to have been sucked dried and stuck to the wall by some kind of red blobbish substance. Molly finds the pocket watch and uses psychometry on it. She sees the girl getting the watch from her father, and her father later dying. Then she sees the creature that attacked Sam and feels the terror Sam felt just before he died. Molly warns that the monster who killed Sam is just getting started. Harry drops Molly off at her family's house, and then goes to see his half-brother, Thomas. He runs some ideas past Thomas about what's going on, but neither of them seem to have any real answers. The next day, Molly and Harry are trying to figure out what the substance is that was holding Sam to the wall. It doesn't seem to be evaporating. Suddenly, something is banging on his door. He goes up to find that it is local mob boss Marcone, Marcone tells Harry to back down on this case. As Marcone leaves, this makes Harry even more determined to find out what's going on here. Review: I actually liked this comic a lot more than I've liked the most recent Dresden Files books. Dresden, to me, is at its best when you have Harry and his allies investigating the weird and supernatural. Too many of the recent books have been so big, dealing with Harry being killed and ending up having to become a knight in the Winter Court. These stories have been very well written, but they just aren't what drew me to The Dresden Files. Down Town is definitely set earlier in the series, and it does a very good job of bringing the reader into the world. All of the characters and their conflicts are explained quickly, but the reader is given enough that they don't feel overwhelmed. 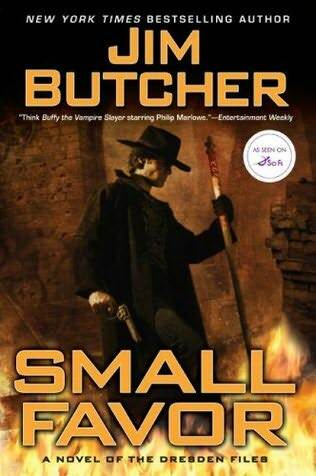 I also thought this book did a great job capturing the voices of the characters, but since series creator Jim Butcher co-wrote Down Town, that's not all that surprising. Down Town also seems to recapture the spirit of the older books very well. It really felt more like a case of the week. This might not appeal to all readers, but to me, this is when The Dresden Files is at its best. If the comic series are all like this, that would give them a huge edge to the later novels in the series. The only thing I didn't like about Down Town was that it almost felt like there was a checklist of characters that they needed to introduce just for the sake of them being there. For example, the scene with Thomas seemed pointless. Thomas is actually my favorite character in The Dresden Files, so I was glad to see him, but the scene itself didn't seem to serve any real purpose. Maybe it is setting up something later in the series, but standing alone, I couldn't help but feel that scene was only there as fan service. The art on this issue was very good. I will admit, I can't help but think of Paul Blackthorne as Dreden, but I definitely thought this version of Harry fit the character much more than the version we've seen on the book covers of the series. You can tell that Jim Butcher has a lot of creative control on these comics, because the characters really look exactly how he describes them in the books. Carlos Gomez also did a great job laying out the settings. From Thomas's salon/coffeeshop to Sam's pawn shop,to the dark wizard's disturbing altar, we are given a lot to see here, and Gomez is able to give them all a very unique look. My only gripe on the art is that I would have liked to see more of Harry's workshop, but I guess I am being hypocritical there. I did think Molly looked a bit like Rose Tyler from Doctor Who on the cover, but Billie Piper would be a real good choice to play Molly, so I'm good with that. For a lapesed Dresden Files fan, Down Town was a great reminder of why I fell in love with these books in the first place. Great characters and great mystery stories that blend supernatural with real crime. Down Town is definitely off to a great start! It did seem like some of the characters were introduced just for the sake of introducing them. A little too much fan service. Is it worth your $3.99? 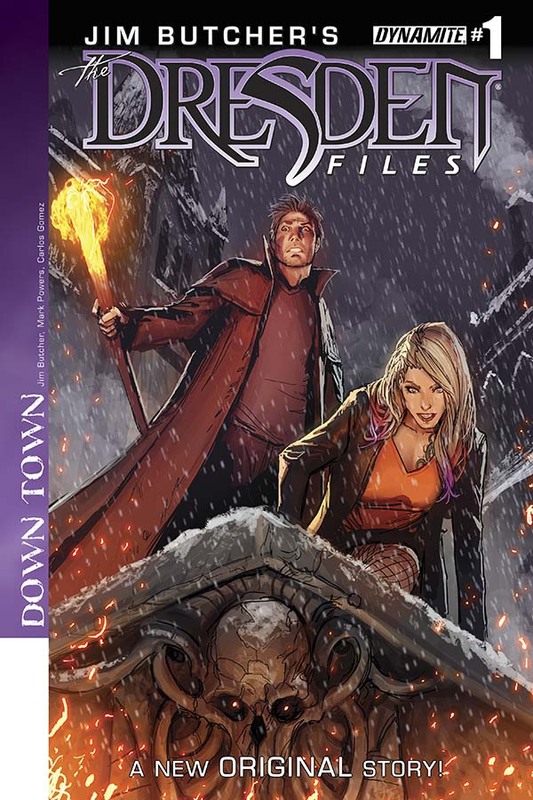 If you are (or were) a fan of The Dresden Files, Down Town is the perfect comic for you. If not, I would still suggest checking it out. The characters are great, and Down Town seems to be a good jumping on point for new and lapsed readers alike.